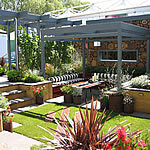 Fleming’s Nurseries have presented Australian Show Gardens at the Chelsea Flower Show from 2004 - 2013. Dubbed ‘The Chelsea Experience’, the annual event involved more than 12 months planning and the collaboration of many of Australia’s most gifted garden designer, constructors, specialists of their fields, artists, media professionals and so much more. The annual event took planning in detail to extreme with every nut and bolt required to build the garden shipped from Australia to London each year. Plant sourcing saw many organised trips across Europe and the UK. The nine gardens presented by Fleming’s are detailed below. We wish to extend our sincere thanks to everyone that was involved in any way with the planning and delivery of these exciting gardens. We especially thank all the designers and construction teams who, for many, put their lives and businesses on back burner to turn their attention to this amazing project – and all should be proud of what was achieved. The project saw Australian Landscape Design hit the media in a big way and did much to showcase Australia’s horticultural talent on a scale never-before attempted. Here is an overview of each garden presented. If you require more information about the project overall or an individual year please contact Fleming’s direct on 03 9756 6105. Fleming’s last entry in 2013 was a celebration. Designed by Phillip Johnson, this garden reminds us that nature is the perfect reference for sustainable design, imperative in the twenty first century. The Trailfinders Australian Garden presented by Fleming’s is a showcase of Australia’s enviable natural beauty and Mother Nature’s timeless design. 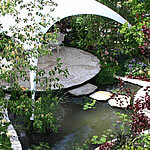 This garden was awarded BEST IN SHOW and Gold Medal … an impressive way to bid our Chelsea Experience farewell. 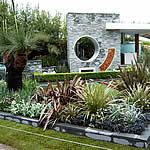 Click here for more information on our RHS Chelsea Flower Show Entry for 2013. A design by Better Homes and Garden landscape personality, Jason Hodges, this garden incorporated some much loved and iconic features of the traditional backyard within the confines of the more modern dimensions. The judges awarded the garden a Silver-Gilt Medal. A design by Ian Barker and built by a team of volunteer landscapers. The design was based on the discovery of and historical link between Australia and England through the voyage of The Endeavour with Sir Joseph Banks. 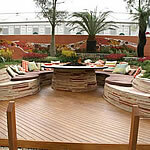 In 2010 Trailfinders and Fleming’s presented a design by Scott Wynd and built by a volunteer section of landscapers. Using Scott’s vast expertise with pools and wet areas set among an outdoor room, this design highlighted the very essence of Aussie outdoor living with a jungle inspired planting scheme. Judges awarded this garden a Gold Medal. 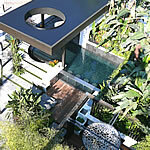 This garden was designed by Australian celebrity garden designer, Jamie Durie, and built by Ian Barker and Associates. The design aimed to highlight some of the many natural products, textures and colours of the Australian landscape, while at the same time offering a practical outdoor lifestyle space. The judges awarded this garden a Gold Medal. Designed by Mark Browning and constructed by Kiama Landscapes and Paving. 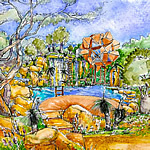 This was the first Australian garden that had not previously been exhibited at an Australian flower show and was purpose designed for the Chelsea Flower Show. 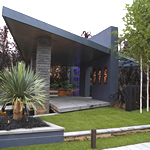 Designed by Dean Herald and constructed by Rollingstone Landscapes, this garden was a re-construction of the garden that won gold medals at Australian flower and garden shows ‘Sydney in Bloom’ and ‘Melbourne International Flower and Garden Show’. This garden was awarded a prestigious Gold Medal. 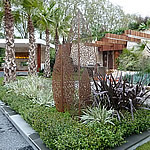 Designed by Jack Merlo and constructed by Total Landscape and Construction, this garden was a re-creation of the garden that won Best in Show at the Melbourne International Flower and Garden Show in 2004. 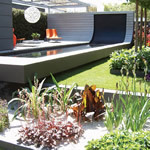 Designed by Jim Fogarty and constructed by Semken Landscapes, this was the first all Australian designed and constructed show garden to be presented at the Chelsea Flower Show in London. This garden was awarded with a Silver-Gilt Medal.